Make your advertising campaign interactive with this fun key ring with light! Available in multiple color combinations, it measures 2 1/2" x 1 1/2" and can be customized with your company's name or logo. It features extra bright white LED lights, a side push-button to turn the lights on or off and flip and click fidget areas. It's perfect for reducing stress and boredom by encouraging focus and self-soothing for users with anxiety, attention disorders and more. It comes with a split ring attachment and button cell batteries. Engage new and potential clients with your brand! If you want people to spread the word about your business to their friends, give them something they can show them with this fun cube! Flip, click, glide, spin, and roll for a great time and to reduce boredom and stress. It helps sooth people with anxiety, attention disorders, and more. 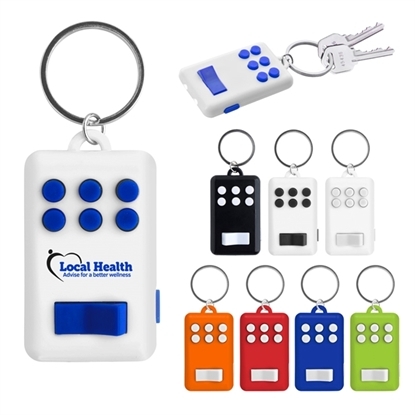 This comes with a wrist strap, is available in plenty of colors, is small enough to fit in your pocket or purse, and is great for all ages (5+). Add a pad printed logo and show that you care about the comfort of your customers! 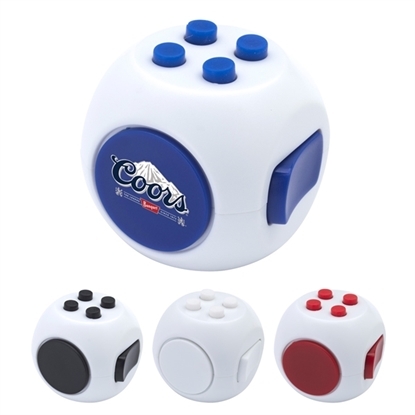 Get plenty of attention for your brand when you make this spinning fun cube a party favor! It's great for ages five and up, and recipients can flip, click, glide, spin, and roll this for a lot of fun. It's a great way to reduce stress and boredom, and it encourages focus and self-soothing for people with anxiety, attention disorders, and more. This comes in four outstanding colors and can be imprinted with your company name or logo. Show that your business knows how to have fun! 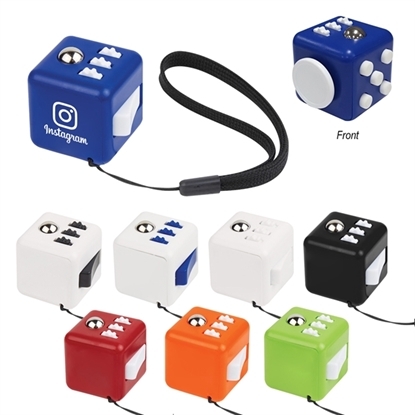 Mypromotionalpens.com offers the largest and best priced selection in Promotional Fidget Cubes. We will price compete and we won't be under sold. Let our graphic designers make your personalized Fidget Cubes standout above the crowd at no charge. We won't stop until you are completely satisfied with your custom Fidget Cubes art proof.Use category search filters on your left to help narrow your search to find exactly what you are looking for.